There was no doubt that Saturday’s game against No. 2 Stanford would be the toughest test of the season for the top-ranked, undefeated USC women’s water polo team. And after four quarters of gritty play, the Cardinal (24-1) pulled off the 6-4 upset, handing the Women of Troy (20-1) their first loss of 2013. The story of the day was defense, as each team scored well below their usual tallies. Both defenses were able to disrupt the usual offensive flow for the opposing squad, but the Stanford defensive scheme proved to be just enough to give them the edge: The four-goal total for USC was its lowest scoring output on the season. Stanford was held down for the most part by the USC defense, but capitalized on the few opportunities they received. Senior two-meter Melissa Seidemann led the charge for the Cardinal offensive attack, bursting out of the gate with the first two goals of the game to put Stanford up 2-0. 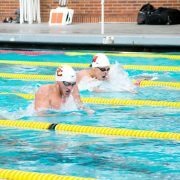 After two consecutive missed shots by USC junior two-meter Hannah Buckling and another missed opportunity by freshman driver Anni Espar, Stanford freshman driver Maggie Steffens found the back of the net to give the Cardinal some extra padding to the lead. 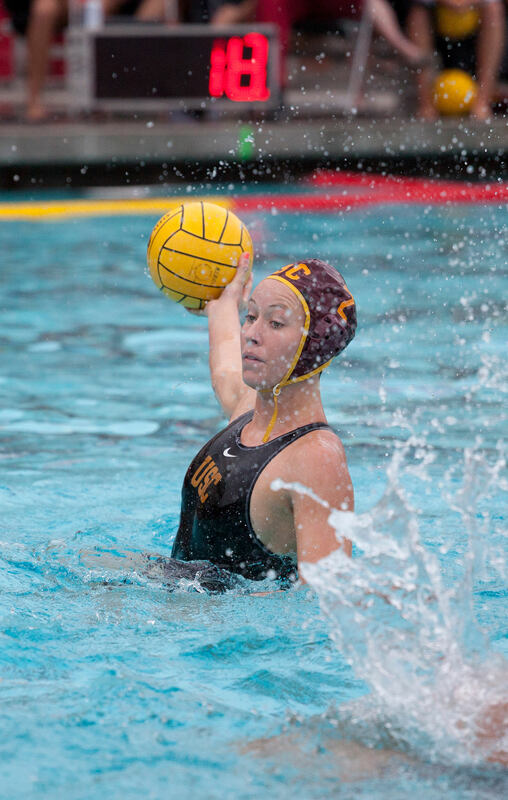 USC junior two-meter Colleen O’Donnell scored before the end of the quarter to cut the deficit to 3-1, but an errant pass on the next possession would ensure that they would not score again in the quarter. The Women of Troy had their first two shot opportunities blocked in the early part of the second quarter, and Stanford capitalized on the momentum to score the quarter’s only goal. The Cardinal were able to make a big defensive stop near their cage and take the ball back the length of the pool, where a guarded Steffens found Stanford junior driver Kaitlyn Lo to increase the lead to 4-1. Both offenses would continue to sputter after the half, as each team would only score one goal in the third frame. Stanford’s came first, as sophomore two-meter Ashley Grossman put her name on the scorecard to bolster the Cardinal lead, 5-1. After a USC timeout, Espar shot a laser past Stanford senior goalie Kate Baldoni from top shelf to make it a 5-2 game. Espar would find herself in the spotlight again early in the fourth quarter, as her converted five-meter penalty shot gave the Women of Troy life as the Cardinal lead was cut to just two goals. The USC offense, however, would not be able to make good on its next few shot attempts, and Stanford junior driver Kaley Dodson finally put the nail in the coffin with her goal from the perimeter, putting the Cardinal up 6-3. USC junior two-meter Kaleigh Gilchrist had two more looks at the net but missed high on both. And though sophomore driver Monica Vavic was able to cut the Stanford lead to 6-4 with just over 30 seconds remaining in the game, the Cardinal held onto the ball for the final seconds to seal the upset victory. A major reason why the USC offensive attack came up short was its inability to score on six-on-five chances. The Women of Troy were ejected fewer times than the Cardinal players were, but also converted fewer chances. USC junior goalie Flora Bolonyai was a star in her own right during the game, coming up with five big blocks. Though the loss stung, she knows it is not the end of the road for this squad. The Women of Troy honored their five graduating seniors before the game, as Constance Hiller, Nicolina McCall, Blair Moody, Dominique Sardo, Georgette Hernandez and Chelsea Silvers all suited up for the final home game of their careers. 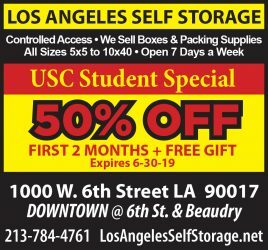 For Sardo, who was a part of the USC squad that took home the 2010 NCAA championship, the day was bittersweet. Though the USC loss evens the playing field in the overall standings, the Cardinal — which is expected to regain the top spot in the national polls — clinched themselves the No. 1 seed in the upcoming Mountain Pacific Sports Federation tournament. The Women of Troy will take on No. 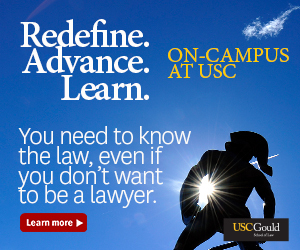 3 UCLA this Friday in Westwood for the right to the No. 2 seed in the tournament.